These scary pictures are worth a thousand screams. Some photos are worth a thousand words—others, a thousand screams. These scary pictures are examples of the latter. Scroll before bedtime at your own risk. Just imagine the home tour: “This is the living room, and down the hall is the kitchen. Oh, and this is my wall of severed heads.” The good news: British Army officer and artist Horatio Gordon Robley had nothing to do with the severing of the heads captured in this 1895 shot. He was a collector of the macabre, though, and that included this assortment of preserved craniums of New Zealand’s Maori people. This isn’t a scene from a zombie movie. As frighteningly real as these figures look, they’re actually just melted mannequins that were damaged during a 1925 fire at Madam Tussaud’s Wax Museum in London. Witnesses said they could hear the mannequins sizzling. Want more creepy stories? Sign up for The Lineup's newsletter, and get our strangest tales delivered straight to your inbox. This is a hell of a class photo. 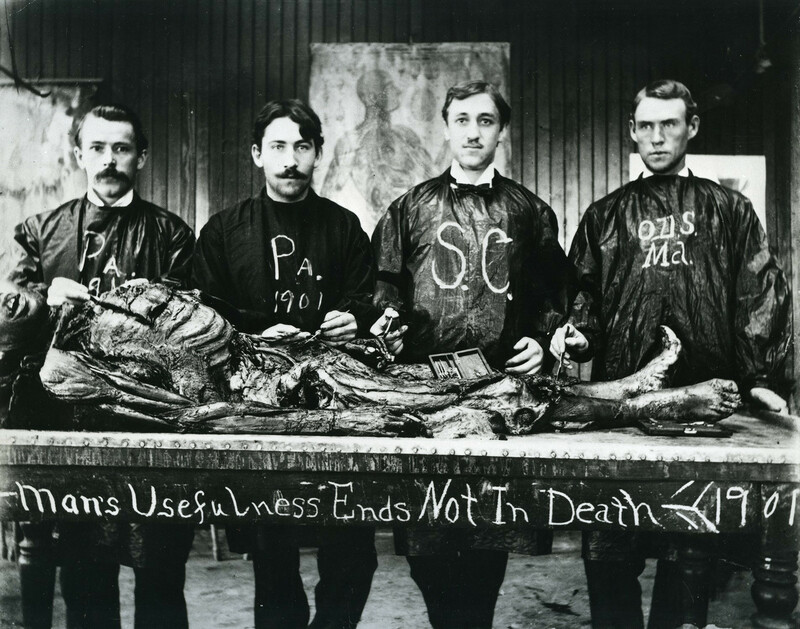 Shot in 1901, this image of an anatomy class depicts students casually posing with a cadaver … with a fitting quote inscribed across the bottom. This chilling photo isn’t of a werewolf caught on camera. It’s actually a shot of a patient suffering from polytrichia, or excessive hairiness. French neurologist Guillaume Duchenne de Boulogne broke new ground in the science of electrophysiology—and he did so through practice, practice, practice. In this wince-inducing photo, the good doctor conducts facial experiments on a live patient, triggering forced expressions with electrical shock. That is one contorted face we won’t soon forget. In what looks like a scene out of The Blair Witch Project, this 1890 photo depicts a woman forced into a crucifixion pose and facing a wall. The woman is actually a patient at a mental institution, undergoing treatment for her condition. Believe it or not, forced standing was considered a legitimate part of treatment for mental illness in 19th century Germany. Dolls are creepy. But a whole town full of them? Even creepier. In the 1950s, the United States government carried out a series atomic bomb tests on fake towns constructed in the Nevada desert. Populating these doomed hamlets were dozens of mannequins that served as test subjects in the blasts. The photo above, taken by a military-grade camera, depicts one such mannequin family at the precise moment of destruction. A flash of light pours through the window as the venetian blinds begin to melt from the heat. In theory, a house made of meat is a dream come true—especially when we’re craving bacon for breakfast. In practice, it looks like this nightmare. Taken in 1937, this photo depicts an English butcher’s delicious idea for attracting new customers: fresh meat hung from his shop exterior in the midday sun. It’s enough to have us considering vegetarianism. Look closely—you’re not seeing a dissection of some terrifying robot/human-hybrid. It’s actually a 1964 photo of two engineers fixing a Disney caveman robot. It’s so hard to concentrate when your smartphone is just a few feet away, or when it’s 1925 and you’re not wearing your isolation hood that blocks all outside sound. Forget snowmen. This winter, build yourself a terrifying snow monster, like this 1902 photo depicts. Before there were store-bought Donald Trump Halloween costumes, there was something much creepier … these homemade children’s costumes in the early 1900s. One Mickey Mouse? Adorable. An auditorium full of ‘em? Terrifying. Before it was a TV show, the Mickey Mouse Club toured theaters across the country. This photo from the 1930s depicts one such meeting, with apparently zero regard for the nightmares it would inspire. This soldier may be smiling, but it’s clear his mind is far from untroubled. The man in this war photo from 1916 is experiencing shell shock, an expression coined by soldiers to describe the hysterical paralysis, confusion, and dazed stares often seen on the battlefields of WWI.